which token is your favourite? This afternoon I bought a house. On Mayfair. And then several flats near Piccadilly. 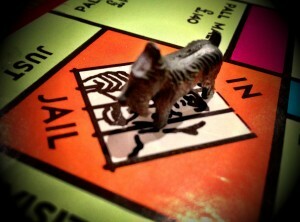 I know it sounds swanky but perhaps less so if I admit I also spent a good ten minutes in jail. 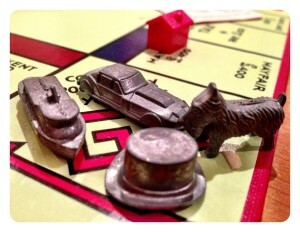 My life isn’t as Candy brothers/Conrad Black as it seems, the Smalls and I were simply playing Monopoly. reminds me of years of paper money fun, tantrums about properties and the dreaded Community Chest cards. But the biggest drama was always who we’d be: the Scottie dog and race car were favourites with NOONE wanting to be presented by the wheelbarrow or thimble. A gentleman called Charles Darrow invented this legendary board game. 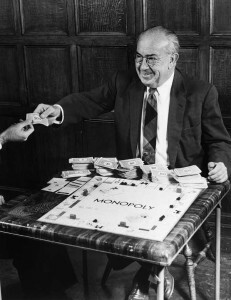 And when he first designed the game he recommended that players should use small items from their home – such as pennies or buttons – to move around the game board. This was before Charles’ young nieces suggested using metal charms from charm bracelets. The rest, as they say, is gaming history. Today’s news is that Monopoly want us to vote a token off the board. In a worldwide vote, your chance to save your favourite token is right here. And, on 5th February, we’ll know which token is being asked to ‘leave the house’. Meanwhile, back to the game. I am likely to have a tantrum if one of the Smalls sends me to jail AGAIN…. 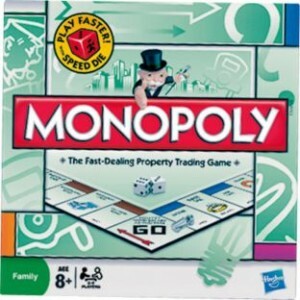 This is a sponsored post but I really am a Monopoly fan. COMPETITION: The chaps at Hasbro have very kindly given me 2 Monopoly Game Boards (each worth £14.99) to give away to my Life of Yablon readers. To enter this competition all you have to do is sign up to my blog (top right of homepage), follow me on Twitter and RT the picture of my 1970s Monopoly set on Thursday 31st January. The lucky winners will be selected randomly on Friday 1st February 2013. Retweeted it, @ummziyad – hope i got the right tweet to rt?